1 RULES YOU WILL FOLLOW FOR LIFE!!!!!! 6 Long time, no talk! 9 You said I could ask you for help, so here I am! 15 Club Ultra Random Gift of the Week! 17 Club Ultra Random Gift of the Week! 18 Club Ultra Random Gift of the Week! 25 RE: RULES YOU WILL FOLLOW FOR LIFE!!!!! RULES YOU WILL FOLLOW FOR LIFE!!!!!! NO SPAMMING ME OR OTHER PEOPLE!!!!!! 1) Do you currently write for The 'Shroom? If so, which position do you hold? 2) Have you ever held a position with the 'Shroom in the past, but subsequently lost or forfeit it? If so, why? 3) Have you ever been blocked from the wiki? If so, what was the reason for your block, and how long did it last? 4) Which position would you like to apply for? 5) Do you think that you will be able to submit your sections on time, neatly organized, with Wiki formatting, and with exceptional grammar? This is the most important part: Below your answers, please write a full-length demo of your section(s). That way, we can have a bit of your work to make sure you can be on the team. Unfortuanately, no. But we had snow days a few days ago. Please PM me your Music & Artwork section on the forums by no later than February 12. If you can't, please let me know so I can excuse you. Remember that if you regularly fail to send in your sections without a good excuse, you will be fired. You said I could ask you for help, so here I am! Please PM me your Music & Artwork section on the forums by no later than March 12. If you can't, please let me know so I can excuse you. Remember that if you regularly fail to send in your sections without a good excuse, you will be fired. Please PM me your Music & Artwork section on the forums by no later than April 9. If you can't, please let me know so I can excuse you. Remember that if you regularly fail to send in your sections without a good excuse, you will be fired. Club Ultra Random Gift of the Week! You got Hoohooros! He'll attack your enemies with his mighty stone powers! You got Bestovius! He'll give you the power to flip dimensions! You got Ashley! 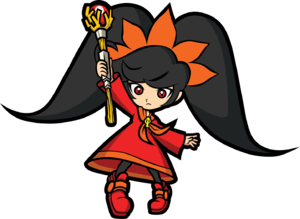 She'll use her magical powers to cast spells on your foes! Ohhh... right. My RPG. Well, the truth is, I don't know how I'm even going to MAKE my RPG. I don't know how I would make the game! What would I make it on? YoYo Games GameMaker? That's not cool... Can you help me find out what to use for the RPG and where I can find good sprites? Yes, I have heard of it, but IDK how to make an account there! RE: RULES YOU WILL FOLLOW FOR LIFE!!!!! This page was last edited on December 10, 2011, at 17:26.